Dabeli: Dabeli or Kutchi dabeli or Kachchhi dabeli is a snack food of India, originating in the Kutch region of Gujarat. It is a spicy snack made by mixing boiled potatoes with a dabeli masala, and putting the mixture between pav (burger bun) and served with chutneys made from tamarind, date, garlic, red chillies, etc. and garnished with pomegranate and roasted peanuts. Dabeli thus has its origin in Mandvi, a city of the Kutch region and even today dabeli masala made in the city are said to be most authentic. 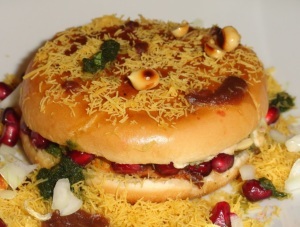 The dabeli is also, therefore, known as Kachchhi dabeli or Kutchi dabeli taking its cue from the region of its origin. 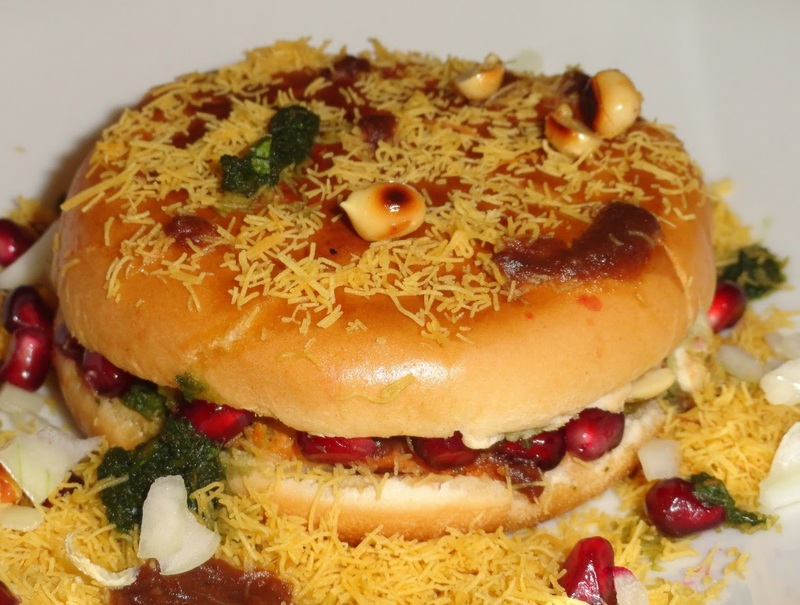 Bhuj and Nakhatrana towns of Kutch are also known for authentic dabeli apart from Mandvi. Dry roast the red chilli, cumin powder, cloves, cinnamon and coriander powder. Let the dry roasted ingredients cool down to room temperature. Grind the dry roasted ingredients to a fine powder, using a dry grinder. Boil the potatoes in a pressure cooker or microwave oven. Fry till the onions become soft and translucent. Fry for a minute on a low flame. Add in the sweet tamarind dates chutney. Add in the mashed potatoes. Add the dabeli masala powder and season the mixture with salt. If the mixture looks a little dry then add 1 or 2 tbsp of water, else leave the water. When done, spread the potato filling on a plate. Sprinkle some grated coconut, chopped coriander leaves and pomegranate seeds on the potato filling. Apply the sweet chutney on one slice of the bun and the red garlic chutney on the other side. Take the slice with red garlic chutney and spread the potato filling, as per taste, on it. Add some chopped onion and coriander leaves. Top it up with some roasted peanuts and pomegranate seeds. Dabeli is ready to be served. Prepare the remaining dabeli pav in the same way. If you have any queries regarding the Dabeli recipe, please leave a comment.